Welcome to our Boca Juniors football shirts shop. This sub-department within our International clubs section of the Soccer Box shop is the home of all things Boca. We are pleased to announce that we have stock in from Nike for the 2015 - 2016 season in the form of the Boca Juniors home football shirt! The classic look never goes away and the dark blue once again contrasts with the rich yellow to represent the club's heritage and tradition. With Nike's Dri-FIT technology imbued into it, this soccer jersey is a great way to show off your broad knowledge of world soccer and an appreciation for the game as a global sport. Get behind one of Argentina's largest football clubs and see if you fancy a shirt today! 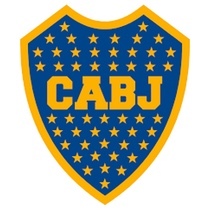 Full name Club Atlético Boca Juniors, the joint largest soccer team in Argentina hails from the La Boca area of Buenos Aires - the capital city of Argentina. The team's name is surprisingly English inspired, with the original founding boys were taught how to play football by British railway workers. The boys, and a lot of the migrants to the multicultural neighbourhood of La Boca, came from the Boccadasse area of Genoa in Italy, lending some weight to the idea of how the area was named. As a football team, Boca Juniors has always played in the Argentine Primera Division since its acceptance in 1913. In the time since then they have gone on to become one of the most successful teams in the country's history, with more than 50 titles to their name. Last season saw the side finish second place, but in 2011 the club won the Copa Argentina for only the second time. Aside that they have claimed 30 Primera Division titles and 18 international titles; a world record shared with AC Milan that technically favors the Argentinian side thanks to two amateur trophy wins in the early 1900s. In the international competitions Boca Juniors can boast winning 6 Copa Libertadores and even the Supercopa Sudamericana, and have achieved so well and accomplished so much that they are one of eight teams to win the CONMEBOL region's treble in its entire history. Boca Juniors are regarded as the top South American club of the first decade of the 21st Century. With such a rich history and a clear trait for producing winners its no surprise that the club has seen notable names come and go. Players like Juan Román Riquelme, Óscar Córdoba, Walter Samuel, Hugo Ibarra, Nicolás Burdisso, Carlos Tevez, Fernando Gago, and Rodrigo Palacio have all graced the soccer club with their talents in recent years before moving abroad to Europe to the top leagues to compete against the best. At Soccer Box you can be sure of top quality authentic soccer jerseys. We have a licensing deal with Nike so that we stock official club football kits directly from their European Distribution Center. We send orders out on a fast worldwide shipping service too so it doesn't matter where you live- we can reach you with your gift order. Check out related products listed below the Boca Juniors products on their respective pages of click the drop down menu for other South American soccer teams and major clubs all over the world.